Rebuild This City: Floating New Orleans Neighborhood? It was a far-reaching tragedy when Hurricane Katrina flooded New Orleans. Thousands of people lost their homes and nearly 1500 lost their lives. In the four years since the hurricane, restoration efforts have progressed but run into multiple roadblocks. Plenty of families are still left without permanent homes while structures are repaired, gutted or rebuilt. Some pretty wacky temporary shelters have been proposed, and some forms of temporary shelters have been used for quite some time, but so far there have been few large-scale housing developments for displaced families. Architect E. Kevin Shopfer has made a proposal that may hold the answer for the beleaguered city: a floating community for 40,000 residents. 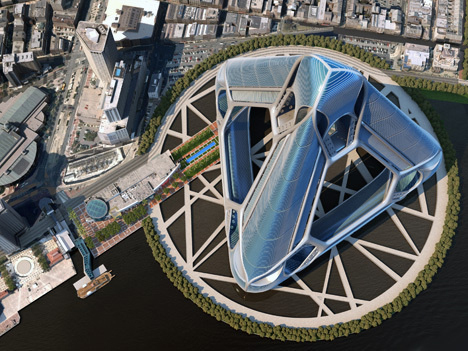 The New Orleans Arcology Habitat (or NOAH) is a self-contained community including residential units, public gardens, offices and commercial space, hotels, schools, a public health office, and even three casinos. 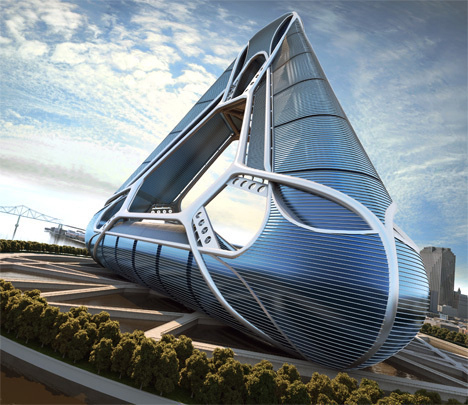 The finished structure will contain an estimated 30 million square feet of space. 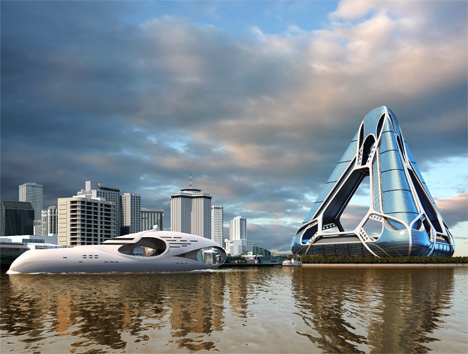 According to the architects behind the proposal, the city’s difficult architectural challenges can be surmounted with a floating structure. NOAH would rest partially on land, with the structure extending out into the Mississippi River. The self-contained community would be powered by three types of alternative energy: solar, wind and water. And since residents could conceivably live, work and take their children to school all within the NOAH, the city’s overall pollution and traffic congestion rates would improve as well. 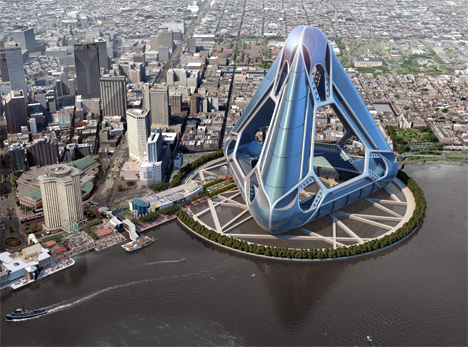 While the pictures look cool and the idea is futuristic and fun to think about, it seems doubtful that NOAH will be realized in 6-10 years as the architects envision. There is, after all, an entire city that could (and, we think, should) be rebuilt: do we just abandon all of that history to build a new place to live out in the water? If so, what happens to the carefully-constructed infrastructure of the old New Orleans? Is it reclaimed by nature after a few years? Moving onto a floating community and losing the city’s nearly 300 years of history seems a little too much like giving up. 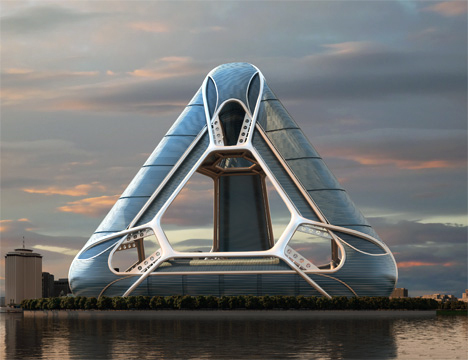 See more in Unbuilt Concepts or under Technology. October, 2009.